See the newly-discovered amazing review of the film at the end of this post! A half-hour live action film, adapted from the story by Isaac Bashevis Singer. Undertaking the creation of this film was a major challenge for me in 1969. Rare for a project assigned to me by Weston Woods, this was a story that had to be a live-action production. Up to that time, I’d directed a few short live action specialties, but ZLATEH THE GOAT was a serious story and required not only studio soundstage scenes but multiple outdoor locations, and a snow storm! This was such a big deal that I went out and bought myself a pair of sturdy Director’s Boots! It also required a goat. I’ve dealt with many great actors, but goats do not take direction. 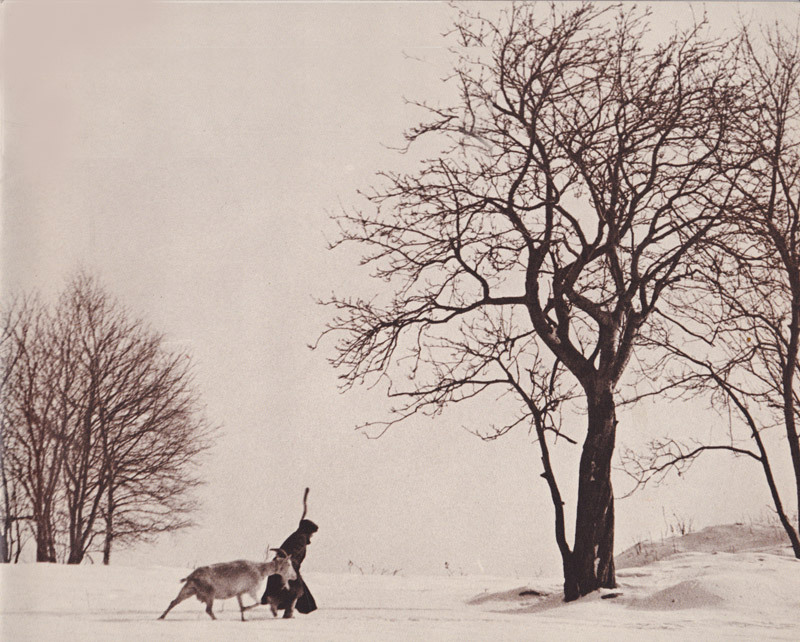 When I saw that panicky goat dragging a sobbing boy the wrong way through the snow on a freezing Bohemian hilltop, I figured it was all over. None of the film crew was having a great time either. There were thirty of us up there, sustained only by the promise of grog and fireside at the end of the shooting day. Our joint efforts were focused on the seemingly hopeless attempt to get an exhausted, whining boy to lead an innocent, befuddled goat directly into the icy blast of a huge airplane propeller as it roared deafeningly, and spat bushels of artificial snow directly into their faces. 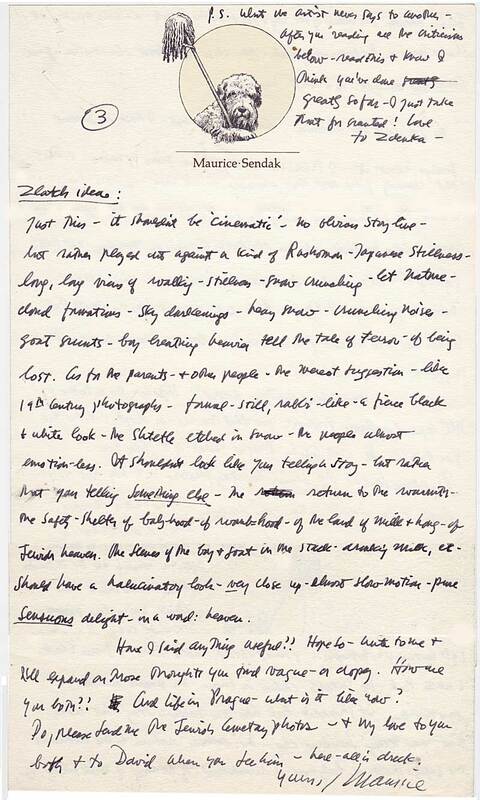 All of this began when Morton Schindel, the quiet titan of Weston Woods Studios, visited me in Prague during May of 1969, bringing a copy of “Zlateh The Goat and Other Stories, by Isaac Bashevis Singer. “How about one of the other stories?” I asked, after reading them all. 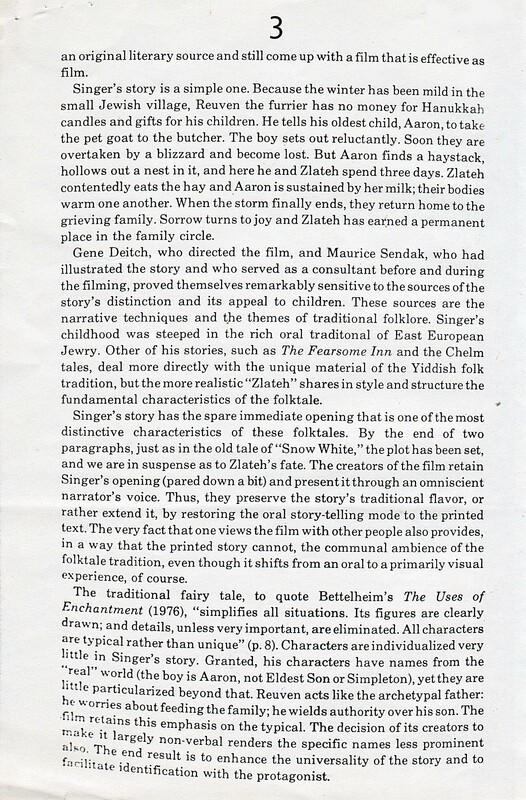 I did like ‘Zlateh” the best, but practical considerations, film experience, cowardice, and other logical reasons, clearly indicated that it would be he most difficult to achieve on film. With 1969 technology, this story could not be convincingly produced as animation. It would have to be done “live,” and that meant big bucks and big hazards, but it was a chance for all of us to surpass ourselves. Mort and I both saw that the film must spring visually from Maurice Sendak’s inspired illustrations. But Maurice’s drawing of the boy Aaron was a distinctly unCzech type, and I knew that if we were lucky enough to find a boy and sisters with the right faces, they would most likely be a non-actors. Jewish settlers were long gone from the North Bohemian backlands, but we found three Czech Gypsy children close to the visual types we sought. 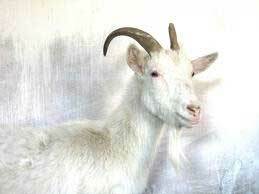 Also, the ordinary nanny goat required would not be the trained type found in a circus, but untrained, on a farm. 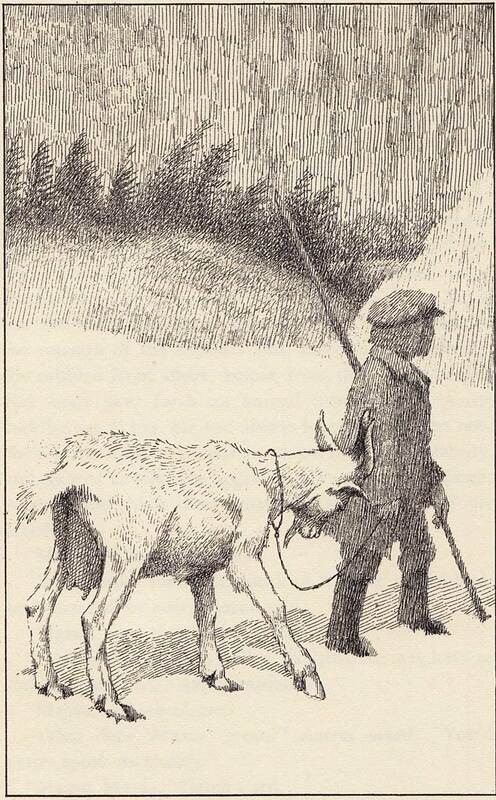 A non-professional boy lead, an untrained goat, the vagaries of weather… what more could a foolish director ask for? But what a story! It had a special meaning for Maurice, as his own forebears came from just such a place and such a life. 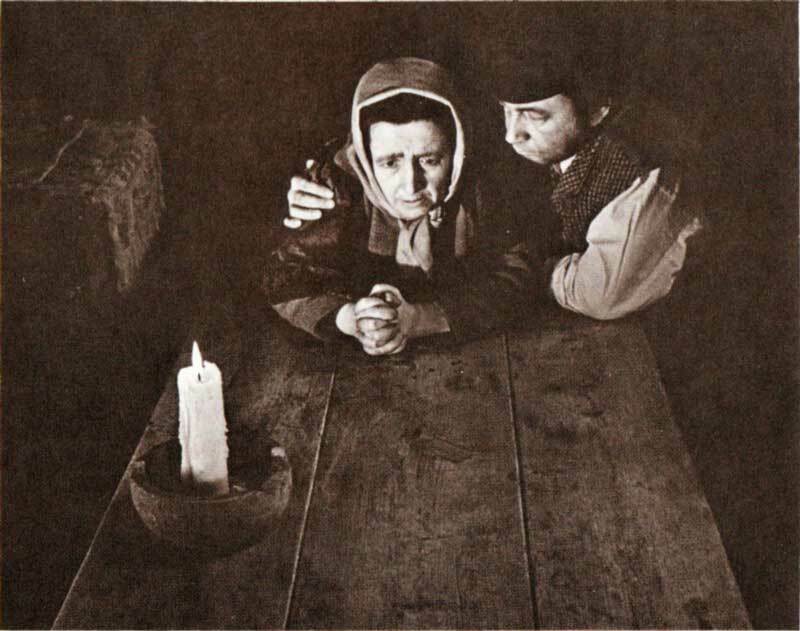 We had only one actual Jewish actor for our cast, Jana Šedová Popperová, who played the mother. As a girl, she had been a prisoner in rhe Terezin concentration camp during the wartime Nazi occupation of this country. 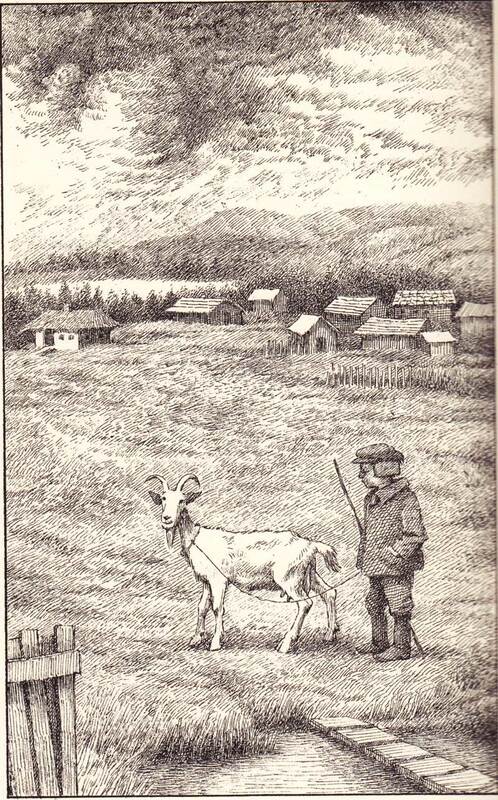 ZLATEH THE GOAT is a story about the connectivity of life, centered on a poor Jewish shtetl in 19th century Poland. Reuven the furrier is having a bad year. It’s winter, but there is no snow. No snow means no customers for his furs. At Hanukkah-time there would be no money to buy gifts for his children. 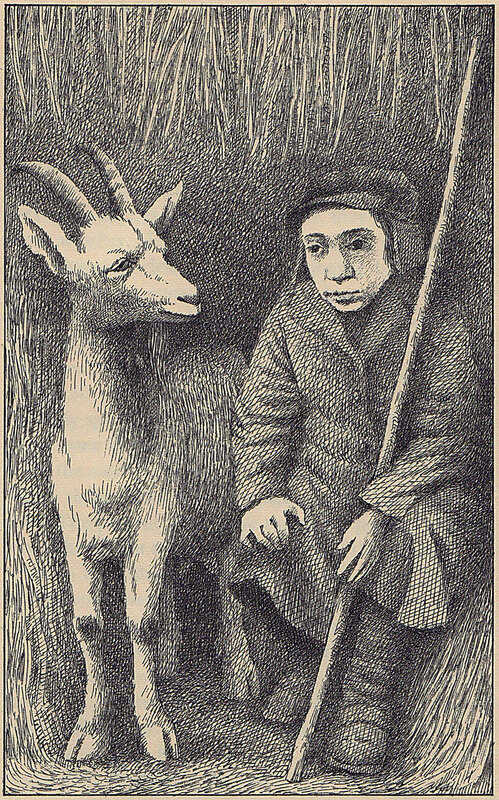 He is forced to sell the beloved family goat, Zlateh, to Feyvel, the village butcher. Reuven’s oldest son, Aaron is appointed the tragic duty of taking Zlateh to her doom. As Aaron and Zlateh are trudging over a desolate hillside, snow suddenly begins to fall, quickly escalating to a fierce storm. 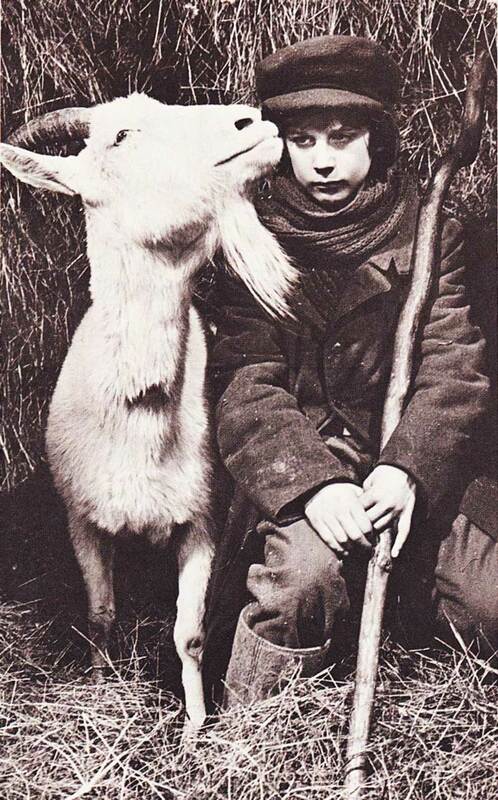 Boy and goat are desperate to find shelter. Through the blinding snow, they miraculously come to a large haystack, and are able and squeeze themselves inside it. 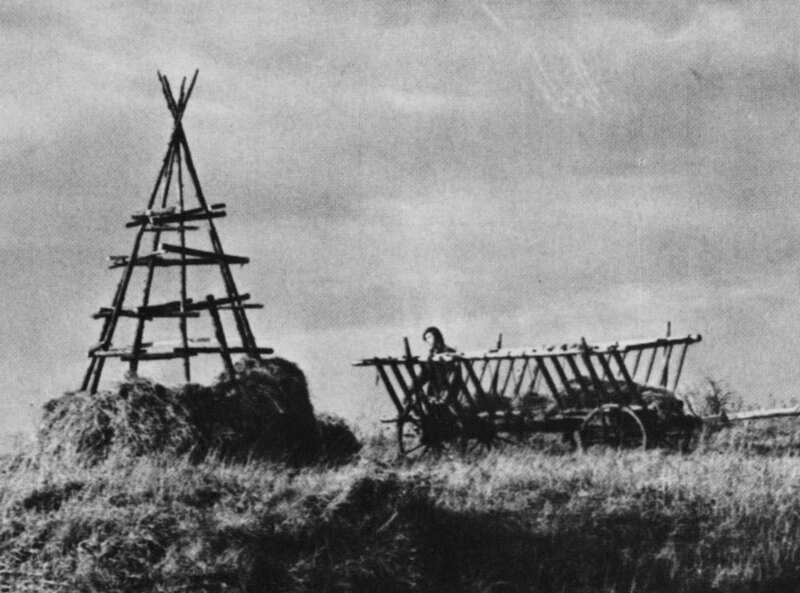 Thus a parable of Jewish heaven is set up.The thick haystack provides shelter. The goat’s body provides warmth. The interior of the haystack provides food for the goat. The goat provides milk for the boy. This symbiosis of mutual self-sufficiency sustains them for three days and three nights until the storm subsides. We had a story of shared isolation from danger, bonding a friendship – a literal port-in-the-storm – a cozy, fragrant (edible for the goat) hide-away, protecting and separating the two from the realities of a hard life. The experience suggests the basic unity of all living creatures struggling to survive. Trust and love is required. I was hoping we could put it all together, and pull it off, but this was no parlor movie. By July, 1972, we were ready to roll. There was outdoor and indoor set construction, and several outdoor locations without visible telephone cables were needed, and a challenging script to follow. 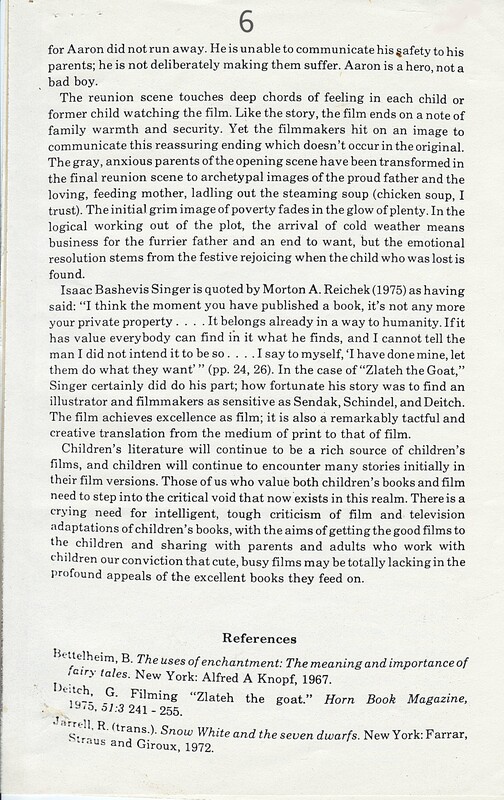 I wrote the screenplay with high ambition and some guidance from Maurice Sendak. The story’s author, Isaac Bashevis Singer, had zero interest in the filming project. He took the money for the film rights, and retreated into his own literary haystack. But Maurice, held this Jewish fable as high in human symbolism. He had put his heart into his illustrations, and had a strong vision of how a film of it should look. He wrote me his “Rashomon” impressions. In spite of the daunting practical challenges, I believe that in essence we achieved Sendak’s basic dream. He loved our finished film. It received rave reviews in the critical journals, and became both a gold and silver medal winner at children’s film festivals. But all that was at the end of a long hard road. Our main luck was that we happened to be in a country bordering Poland, with identical style wooden cottages, so we didn’t need to go abroad to shoot our exteriors. In fact, we found the exact little cabin close to the Polish border, within walking distance of our own mountain cottage, so we were able to sleep and feed the entire 30-man film crew at our own place! OK, so most of them slept on the floor! Mainly what we all did there was wait for the necessary weather conditions. It had to be gloomy, and when needed, it had to snow. We were in exactly the same situation as Reuven, the furrier! We also had a truck with alternate goats, a load of hay, and a goat trainer, another truck loaded with bags of artificial snow, and a large tractor onto which was mounted a propeller airplane motor. And of course vans full of camera equipment and plenty of 16mm film rawstock. Our budget, and intended school and library distribution did not require the far heavier 35mm gear. 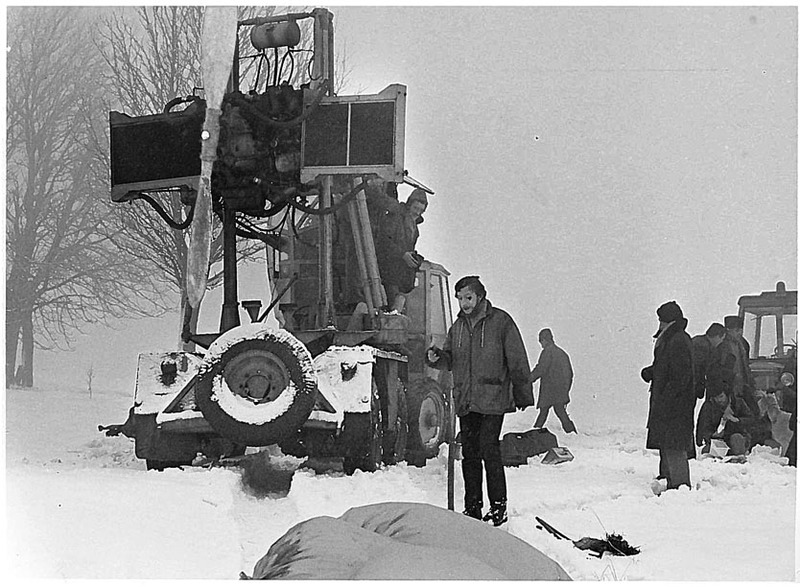 All the snowstorm scenes were shot in that same surrounding countryside. All of us helped between takes to smooth out footprints in the snow,. That’s Zdenka, caught in a deep bend-over by the studio’s still photographer! Aaron’s lonely walk, before the snow began, was shot right on the Barrandov studio vast wooded back lot, where we were able to use a high lift camera crane, and where we were close to technical facilities. 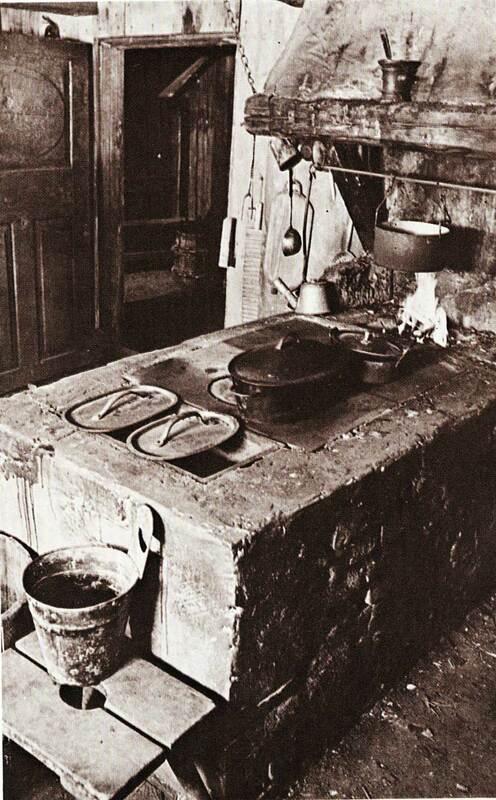 The interior cabin shots were made on a sound stage, where a set was constructed to the exact measurement as the mountain cottage used for the exterior shots. That cabin was occupied by an aged woman who refused us entry! The interior haystack scenes were also shot within the studio, as we needed tracks and special “heavenly” lighting. The one long-shot of the haystack on the morning after the storm was actually a miniature set we built in the puppet studio! 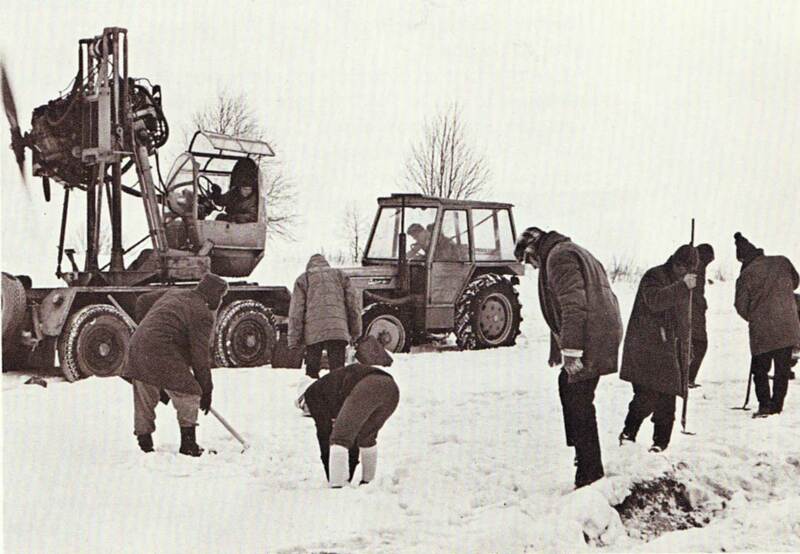 We had to be constantly ready to quickly move all equipment, crew, actors and goats back and forth from Prague to Northern Bohemia to catch the needed weather conditions. A couple of times we were too late, and got nothing! Finally, we had to wait until Spring to get material for a dream sequence, and the final shots of our little 25-minute movie! My late best friend, actor Allen Swift, did the opening and closing narration to perfection. In total, with praise from all children’s literature critics and writers, and all prizes possible. 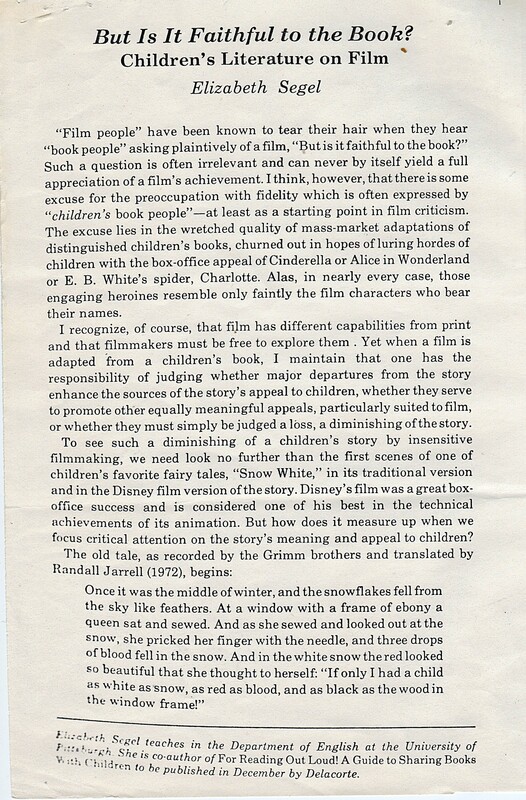 The film was a hit, and today, shortly after the death of Maurice Sendak, it should be of great interest to the school and library market of Weston Woods. But the sad reality is that the film is no longer even in the Weston Woods catalog, but residing in their dungeon! The rules specify that “every word of the adapted books must be included in the films” Every filmmaker knows that if I have a scene showing Aaron and Zlateh walking down a path, and they pass fields and cottages, and a dog ran after them and barked, that I would not need a narrator to say, “Aaron and Zlateh passed fields and cottages, and a dog ran after them and barked/” Yet that’s exactly what this new law requires! 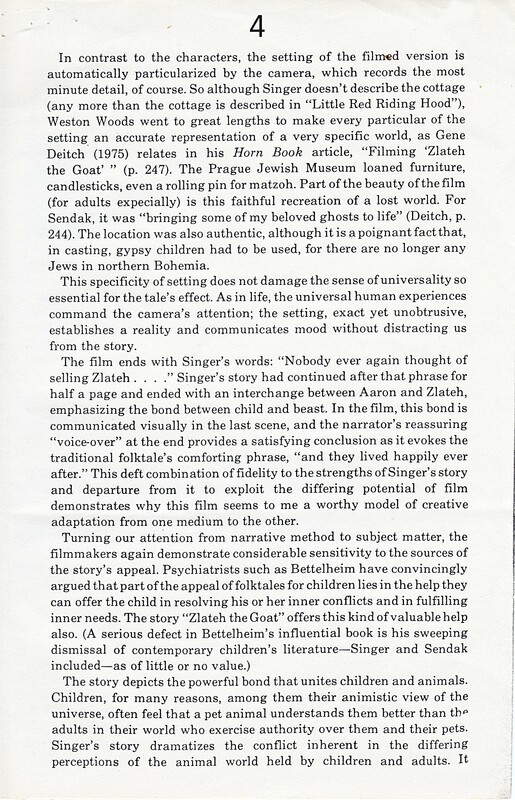 At the time we filmed ZLATEH, no such misguided condition existed, and Mort, Maurice, and I wanted the film to be largely non-verbal. I worked hard to show everything Singer described in his story. Our little movie is entirely faithful to the spirit and meaning of his story. But today, ZLATEH doesn’t conform to this small-minded interpretation of fidelity, and is thus remanded to the scrap heap. If you want a copy of this film, and you cannot get Weston Woods to sell it to you, your only chance to see it is here on my contraband blog! I hope you will enjoy it, and will spread the word if you do! The name is an affectionate form of the word for gold. Polish currency is the zloty. The Czech word for gold is zlato. Something golden is zlaty. 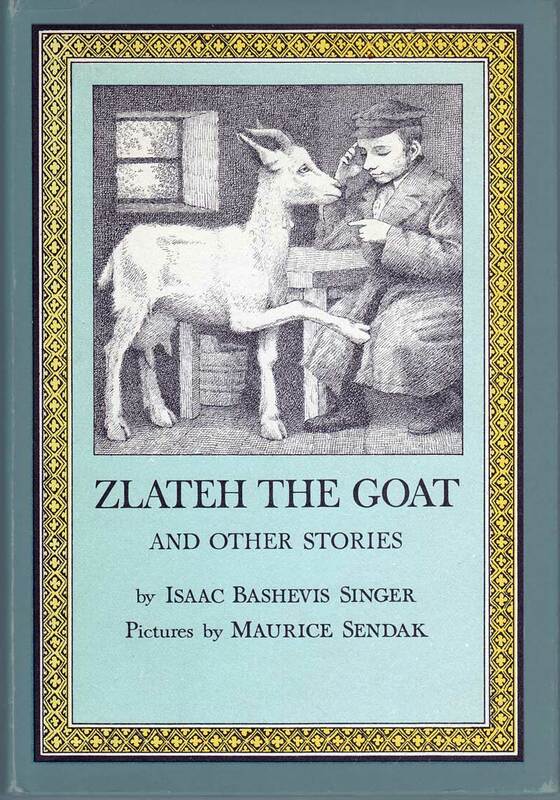 Clearly, the author of this story, Isaac Bashevis Singer, wanted to indicate the great value of Zlateh the goat to Reuven’s family. Note also that Feyvel, the butcher offered “eight gulden“ for her – another word for gold. In medieval times Jews were not allowed into the craft guilds, so you are unlikely to find Jews named Carpenter, Cooper, Smith, or Granger. Christians believed that money changing or charging interest for loans was un-Godly, so Jews were allowed to be money changers, and many of the myths of Jewish greed, cheating, or usary grew out of the fact that banking and lending money was one of the few occupationss allowed to Jews. During the Hapsburg régime, and especially during the reign of Maria Theresa, Jews were required to drop their Hebraic names and forced to adopt Germanic names, often related to monetray value.. Thus many Jews today still have names like Golden, Goldberg, Goldstein, Silverstein, Diamond, etc. 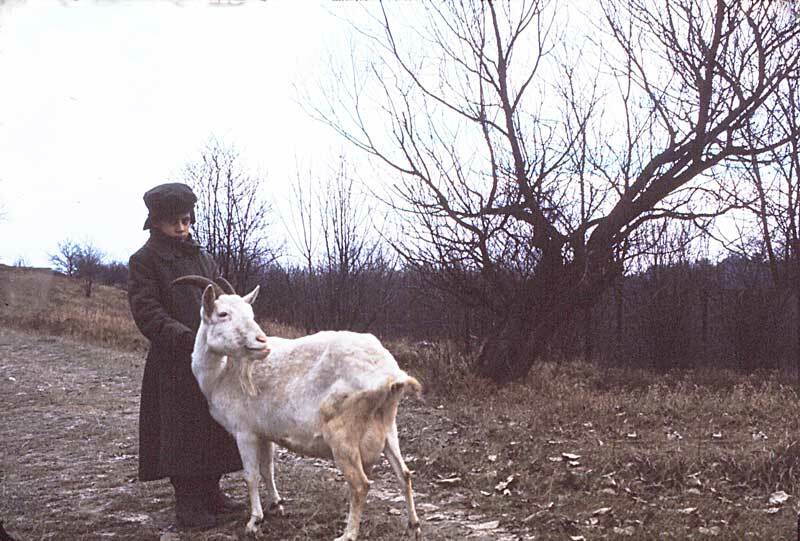 Zlateh the Goat is a gently thought-provoking little 16mm film based off of a children’s story of the same name by Isaac Bashevis Singer. Lucid and dialogue-free, Gene Deitch, a Prague-based illustrator, animator, and filmmaker (who has directed several Tom and Jerry episodes), directed this parable about a Polish family who is forced to sell their goat to the town butcher on account of the need to purchase holiday supplies such as candles and food instead. 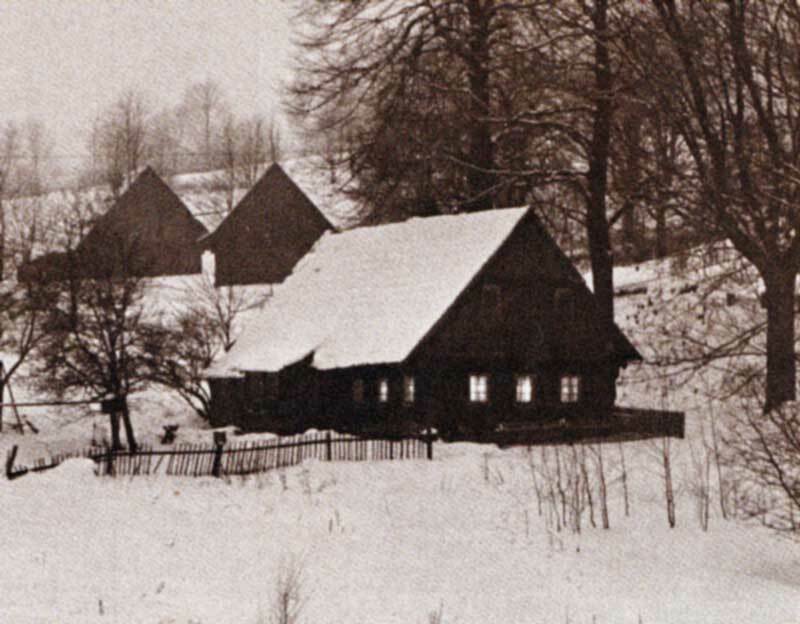 The setting is an austere Polish village before the onslaught of a late winter, and is cushioned within the economic and cultural strife of pre-World War II. It’s not easy to write the film off as simply a juvenile piece. 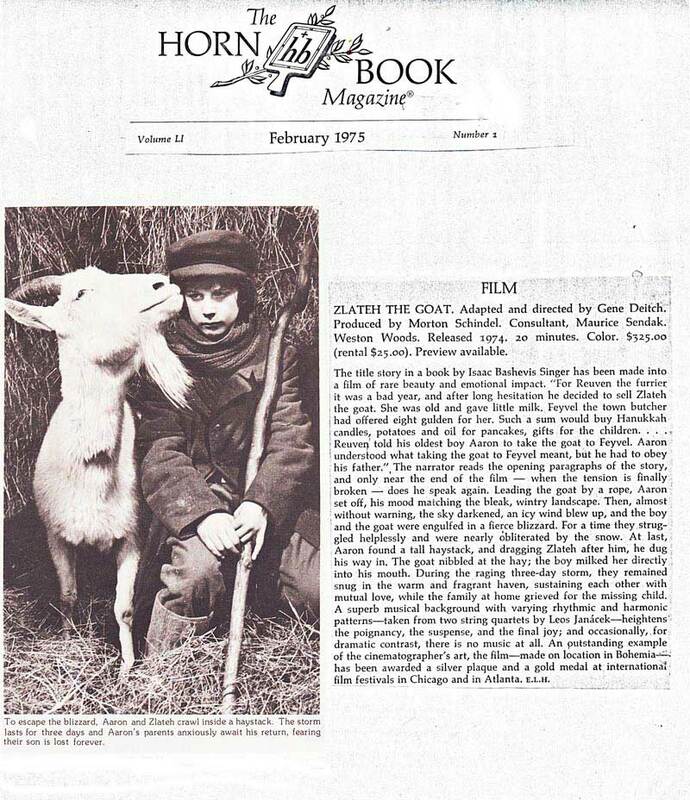 Besides the typically instructive narration which bookends the film (and which is clearly suited to children), Zlateh the Goat approaches the plain poeticism of Albert Lamorisse’s structurally and thematically similar White Mane. Deitch introduces the short with images of familial comfort, first capturing a cozy shot of the small wooden cabin and then entering the house to surround a family who wears their worries as blatantly as a bad toupée. They decide on sending their eldest son on a voyage to town to greet the butcher, who is familiarized in an uneasy image beside a skinned mammal, and also in the close-up scraping of knives. These shots are intercut with sharp wind intruding on the boy’s path, a weather pattern that gradually evolves into torrential snowfall. A very palpable negative connotation envelops the butcher, and by extension the trip towards him. Eventually the whiteout snow renders the boy and Zlateh (pulled by rope) a tiny dot amidst their unfavorable surroundings. Meanwhile, Deitch flashes momentary, evocative glimpses at the boy’s tense mother at home, slumped beside the window of course. 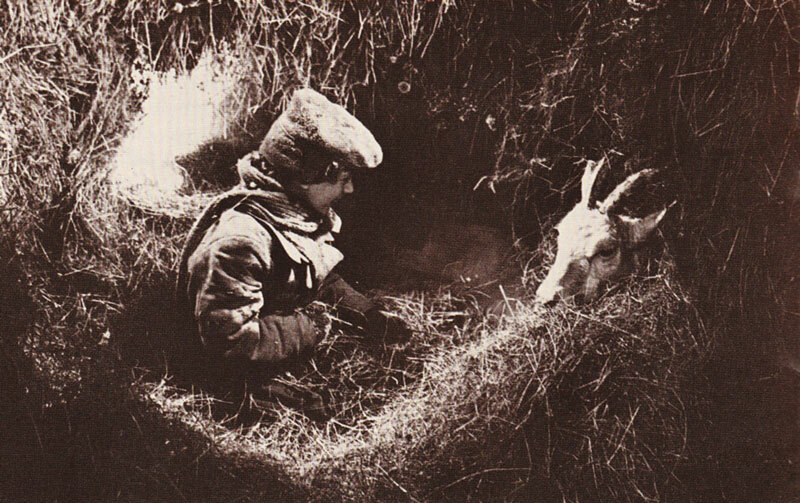 The boy thankfully discovers a tall heap of hay where he escapes from the cold field with his goat, who eventually provides him with milk and warmth. This, the middle section of the film, is the most accomplished, appearing almost Bressonian in its simplistic rhythm. 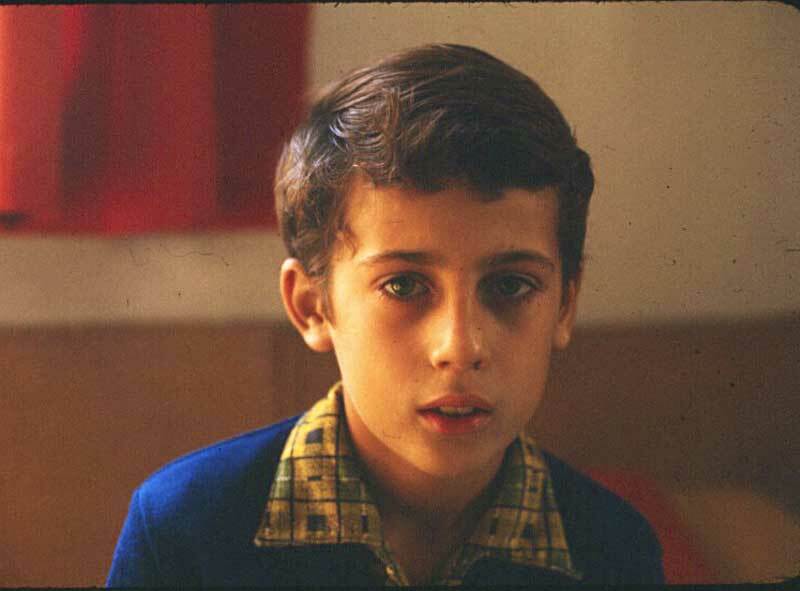 Melancholy strings accompany the entire affair, exemplifying the touching nature of the boy and goat’s relationship. 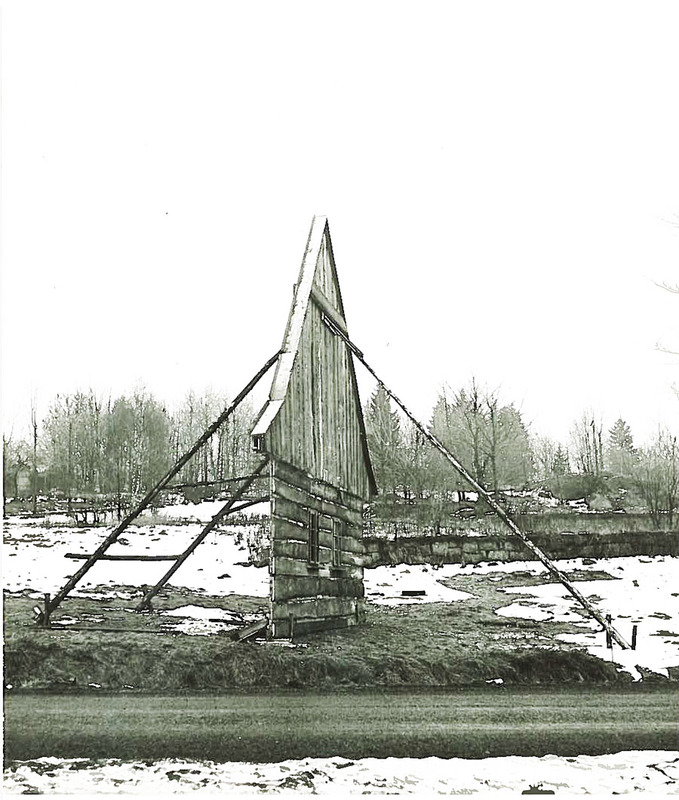 As the snow piles up around the stack of hay – the exterior shots of which are abstract and recurrent – and the boy holds his goat tight, Deitch cuts away to comforting images of a sunny poppy field. Surely this is the type of poetry that a child can grasp, and it’s rather sentimental, but it comes across swiftly and poignantly; Deitch certainly knows how to make his way through a story sparingly, and one can imagine him marking off checkpoints as he goes. 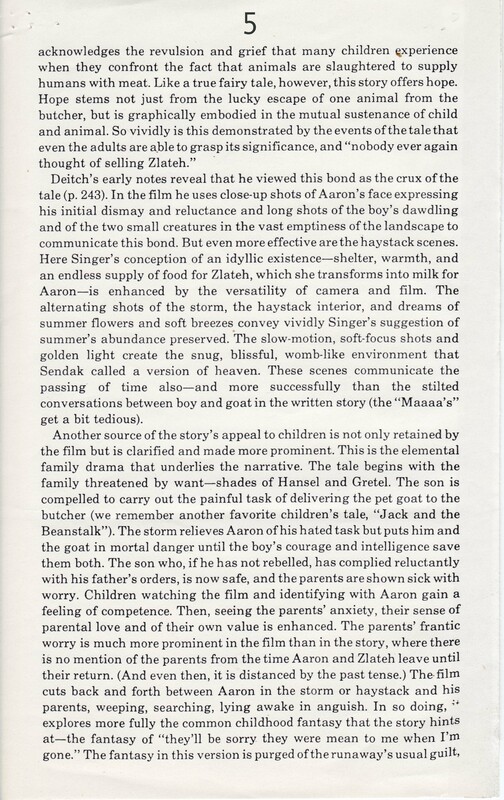 It’s a film that is quite enjoyable to look at, with its grainy footage never demanding of attention, and Deitch also figures out a way to throw “the interdependence of man and nature” into a child’s set of knowledge. 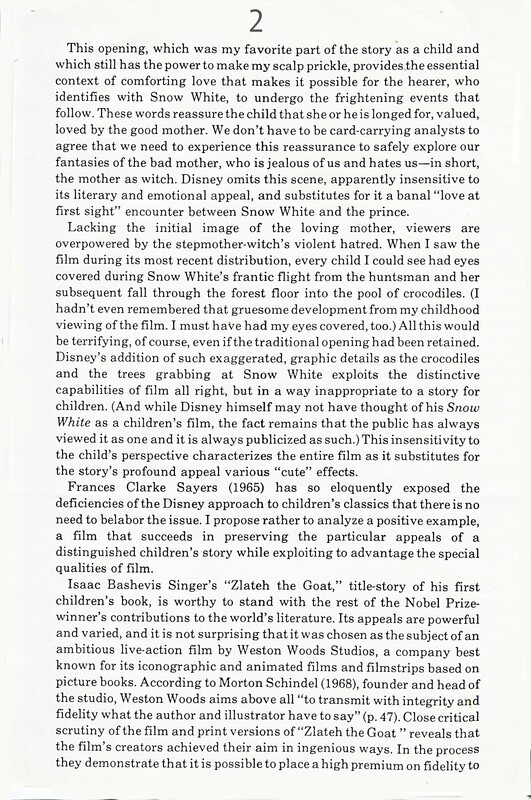 Reviewed by Carson Lund, copied from his blog. This is the third section of the humongous work of art that this storyboard is! The slideshow contains 65 drawings, enjoy them! This is the third section of the humongous work of art that this storyboard is! The slideshow contains 179 drawings, enjoy them! This is the second section of the humongous work of art that this storyboard is! The slideshow contains 216 drawings, enjoy them! This is the first section of the humongous work of art that this storyboard is! The slideshow contains 332 drawings, enjoy them! Here are the songs and a link back to Credit 56! 02 I’ve Got It All! 14 Lie, Cheat and Steal!